Since we've been keeping all of this under the wraps for the past half a year or so, I'm sure this must be coming pretty much out of nowhere, but yeah, here we are: a new western VN publisher and we have some announcements to make. Alright, then let's get right into it. We have a lineup of five visual novels planned for 2018 and early 2019. Before someone asks whether we aren't biting off more than we can chew there, let me assure you that this is not the case. We're happy with the team we have, and our first title to come out -- Fureraba -- is already fully translated and edited with only QA remaining to be completed. Based on the work process we went through for that title, it's possible for us to say that our schedule for this year is more than realistic. But before we talk about individual titles, I would say it's important to first off all talk about ourselves -- NekoNyan. You see, all of us had been pretty dissatisfied with how things were going in regards to the Western VN/eroge market. It just felt like many -- not all -- of the only few localizers don't really have a passion for what they're doing, nor do they seem to actually understand much about it. We talked to many of the Japanese devs, and the truth is (unsurprisingly), they had been getting the same impression. That whole KS practice that just came to be the default for most companies is anything but liked over in Japan. One company we talked to said it'd feel like those localizers are trying to span a safety net, which would, in turn, give off the impression that they don't really believe in their title(s), nor care. That has also been showing in the quality of individual releases, and also how the community gets treated. So yeah, we thought to ourselves that if we actually have the opportunity to try and change things around ourselves rather than lamenting the situation, we should give it a go, and we did. It then turned out that Japanese devs are a lot more open to Western releases than popular opinion suggests and quite pleasant to work with. Maybe we just had luck on our side, but things went really well for us. All right, let me now quickly share with you guys how we're planning to go about things in general, and the direction we want to take this endeavor. - Our goal is to be as transparent as possible. And not just transparent, we want to be more directly involved with the community, which is also one of the reasons you're seeing forums on our website. We want those forums to be one more additional place where we can all exchange opinions conveniently. - No crowdfunding. The first few releases have already been fully funded using our own, private money, so no worries there. We're likely going to offer pre-orders, though, and throw in some extras there for those who really want to support us ahead of release. Don't worry though, pre-order bonuses will also be included in all purchases up to a few weeks after release. - Our games will be released on Steam, and also other platforms, including our own store, where we're going to distribute the unrated versions of the games. One of the things you're going to get, though, is uncensored patches for the Steam version. Those uncensored patches are going to be available for free on our website. It doesn't make any sense to us to paywall Steam users from that content when they're paying the exact same money. We feel like that's simply not the right thing to do. - We know many of you love physical copies and we've quite extensively discussed how to go about this. For now, the plan is to let you purchase physical copies through a pre-order system since we can't really afford to overstock at the moment. 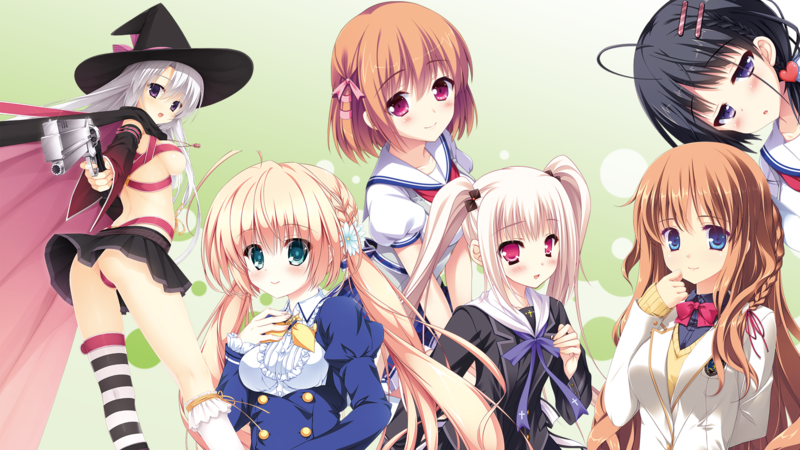 The first title that is going to get full physical treatment, including an awesome lineup of official tokuten/merch is Yuzusoft's very loved Sanoba Witch. And yes, you won't be getting just some cheap copies, you'll be getting the official stuff. The good stuff. We hope you understand that due to time constraints (and lacking funds) our first two releases (Fureraba and Hello,goodbye) won't be getting a physical release. At least not initially. Depending on how much you guys want it, we would love to do limited physical releases a little bit later. We also have many other plans that we're incredibly hyped about and we're going to share those with you as soon as we've worked out the details!